A compelling biography of NZ's first state nutritionist and first woman MD who was a pioneer of school milk, iodised salt, and fluoridation, and a nutritional trailblazer. Whether or not you have heard of pioneering nutritionist Muriel Bell, she has had a profound effect on your health. Appointed New Zealand's first state nutritionist in 1940, a position she held for almost a quarter- century, Muriel Bell was behind ground-breaking public health schemes such as milk in schools, iodised salt and water fluoridation. The first woman in New Zealand to be awarded the research degree of Doctor of Medicine (MD), in 1926, her subsequent pioneering research on vitamins and minerals helped to prevent deficiency diseases, and later, optimise health. Bell's early research into fats and cholesterol tackled the complexity of nutrition-related aspects of coronary heart disease. At the base of her commitment to science lay a deep social concern, especially for women and children. 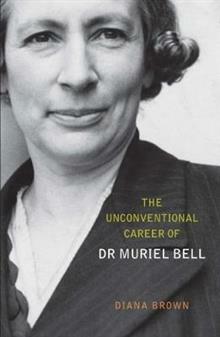 In service to this cause Muriel Bell worked tirelessly. As a lecturer in physiology from 1923 to 1927, she had been one of the first women academics at Otago Medical School. In 1937 she became a foundation member of the Medical Research Council, serving for two decades while simultaneously she was the sole woman on the Board of Health. Her nutritional advice - common sense to us today but revolutionary at the time - was to eat more fruit, vegetables and milk products and to cut down on sugar, fat and meat. Muriel Bell was a trailblazer by anyone's definition, unswervingly committed to the understanding that we are what we eat; that nutrition is a cornerstone of individual and public health. Diana Brown tells the story of this extraordinary woman in this long-overdue biography. Diana Brown graduated with an MA in history with distinction from Otago University in 2006, and was awarded a grant by the New Zealand History Research Trust Fund to write this book. She has lived overseas since 2008, working at writing, teaching and curriculum development, editing and translation. She speaks several European languages.